Today we’re releasing a new update of Flame Painter 3, your go-to software for adding light, streaks, smoke effects, for creating fascinating backgrounds and much more. The new update features important changes such as support for high-DPI displays or the new registration system. Until today, the Scale option was not implemented into Flame Painter like in the rest of our apps. This has changed - from Flame Painter 3.3 you can enjoy the software in higher resolutions with easily readable user interface, in both Personal and Professional edition. The UI will adapt to your high-DPI display automatically at the start. New Community menu has been added to the top menu - you can now access Gallery, Forum or your Account easily directly from application. Moreover, you can publish your flamboyant Flame Painter artworks from this menu. From version 3.3, Flame Painter no longer supports registration keys. New as well as existing users will need to login to Flame Painter 3.3 update using an existing Community account. - Use login details - email/username and password - of your Community (previously Gallery) account of Escape Motions website. If you don’t know the password to your account, enter your email address here to create a new password. - If you own Rebelle 3, you already have the Community account. Login to Flame Painter 3.3 using your email/username and password. Enter your registration details (email and registration key) for Flame Painter 3 on this Download page. Here create your username and password and click “Confirm”. You will receive a confirmation email - confirm your account by clicking on the link in the email. Done! Go and register Flame Painter 3.3 with your email/username and password. 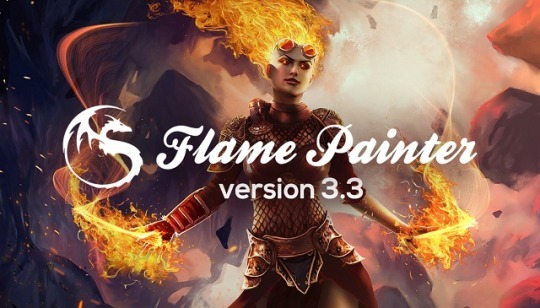 Download Flame Painter 3.3 update and Flame Painter Connect for PS CC 2019 from our Download page using your registration key - this is the last time you are going to need it. The update is free for all Flame Painter 3 users. Enjoy the update to the fullest!